If you thought the true gothic novel died with the nineteenth century, this will change your mind. [The Shadow of the Wind] is the real deal, a novel full of cheesy splendor and creaking trapdoors, a novel where even the subplots have subplots…. This is one gorgeous read. And the subplots are fantastic. I recently criticized A Game of Thrones for its numerous subplots, but Zafón keeps a tighter grip on his story (so I’m not being inconsistent). The core of the story is simple: Daniel Sempere is the son of a bookseller in Barcelona, 1945. After discovering a book by Julián Carax, he tries to find the author’s other works, but instead learns that someone has been tracking down his writings, book by book, and burning them. 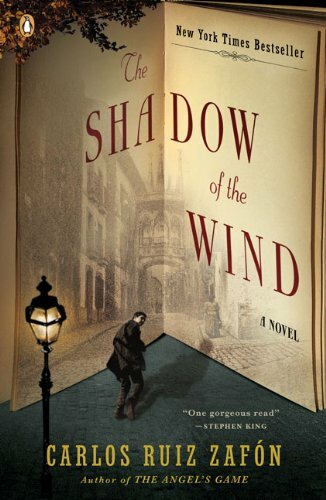 Though Daniel’s copy of The Shadow of the Wind may be the last, this story does not sink to a game of keep-away with Daniel running around Barcelona a la Robert Langdon with a book under his arm. The book, and Daniel’s curiosity in Carax, are used to pry up other, more interesting, secrets. Though there are many characters and backgrounds, they all come together. For its complexity, the story and pace are remarkably controlled; the characters are vivid, and the plot twists are brilliant. Stephen King’s description of “cheesy splendor” is spot on in the best way. This is the sort of thing that usually elicits an eye-roll from me—”waiting for me there […] probably since before I was born”—because it’s self-important and overstuffed with meaning. But within Zafón’s carefully constructed world, Daniel’s sentiment doesn’t feel overwrought. Unlike many other authors who use such heavy foreshadowing, Zafón delivers. If you’re going to foreshadow a big, sweeping adventure, you need to come through on the promise. Because Zafón is holding several aces, this overblown way of speaking isn’t merely irksome; it builds the mood and excites the reader. Translation: READ IT! It reads quickly, so it’s nice for the summer. I’ve given out 3-4 copies, and I do have a loaner copy if you really need one (and only if you know me in RL to return it). For the record, I only keep loaner copies of my most favorite books to push on people: this, Interpreter of Maladies, A Visit From the Good Squad… so don’t think I double up on everything. You won’t see my book collection on Hoarders.